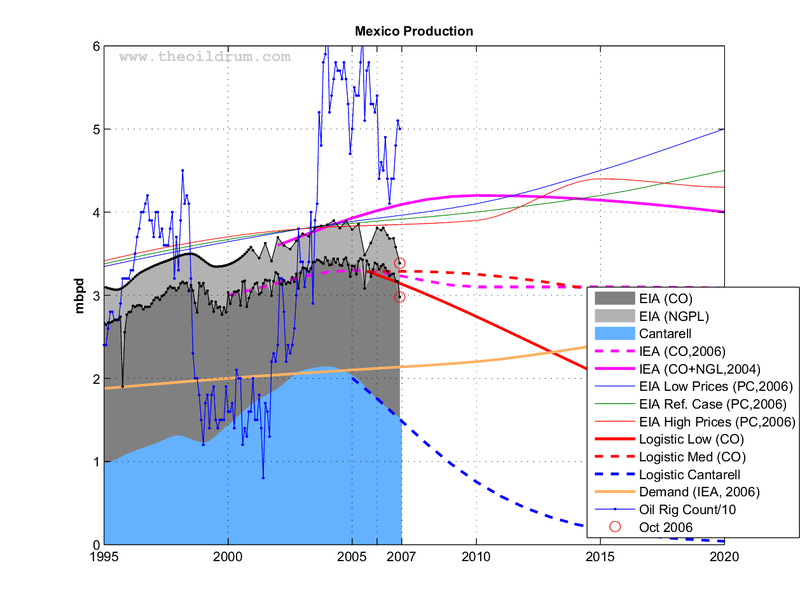 In response, we offer some points on Current, Past & Future Issues with Oil Production in Mexico. The information presented exceeds what is needed to answer the questions, because we’re interested in kicking around the ball with folks with discussions on: the future of the Mexican economy & the future of the Peso – and these topics hinge heavily on Mexican oil production. Production of basic petrochemicals, including: ethane, pentane, propane, butane, naphthas and raw materials for carbon-black, hexanes, heptanes and methane. Caveat: PEMEX is permitted to contract the services of private firms via public works or services contracts, “in order to better conduct these activities”. * Most Mexican oil and gas activities are considered to be part of the “Mexican Oil Industry” and can only be carried out through PEMEX and its subsidiaries. Production of secondary petrochemicals: ammonia, benzene, dichlorethane, ethylene, methanol, ethylene oxide, para-xylene, propylene, toluene, xylenes , et al. The Mexican Gobierno has “direct, inalienable and unforfeitable ownership of hydrogen carbons, including those in an intermediate state” = petrochemicals. For further direct information, drill into: Articles 25, 27 and 28 of the Mexican Federal Constitution, the Regulatory Statute of article 27 of the Mexican Federal Constitution Regarding Petroleum, the PEMEX Act, the Energy Regulatory Commission Act, the Hydrocarbons National Commission Act, the Public Works and Related Services Act, the Public Acquisitions, Leases and Services Act, and the Foreign Investment Act. AMLO/PRD & some the other parties (PRI to a lesser extent) – NOT PAN – all allege that there is plenty of crude oil available without tapping into deep water Gulf of Mexico crude oil reserves. Various parties have claimed that there is so much theft of oil, misdirection of oil from pipelines within Mexico, and AMLO alleges so much corruption within PEMEX, that if the Gobierno Federal simply fixed these problems, there would be plenty of oil & oil revenues for the fiesta (that is much of Mexico) to continue. Oil production and oil revenues have been falling: Oil revenue fell from $26 billion in 2007 to $25 billion in 2008, according to Mexico’s Central Bank and is expected to decrease even more in 2009. The bottom blue-dotted curve (Cantarall output) is the one that scares Mexican politicians and oil-industry experts the most, since PEMEX has been able to temporarily maintain output (within 6% of peak values) by boosting production at other fields. The big remaining question is: How long can PEMEX increase production further in existing fields as Cantarell’s output falls further, without also exhausting all their other fields? Various past surveys have estimated that Mexico’s deep water Gulf of Mexico oil reserves exceed Saudi Arabia’s reserves, including those in the Yucatan Strait (reserves that the Chinese are eye-ing via horizontal boring???). My US, British, & Norwegian oil-company collegues (buddies) tell me that Mexico and PEMEX do not have either the equipment nor the personnel expertise to access her deep water reserves. Foreign deep water oil drilling companies seem to know that they have Mexico over a barrel, as they continue to insist on either a future percentage of the crude oil or future percentage of the oil revenues as a pre-condition for their performing deep water drilling. The information presented above seems to indicate that the Mexican Gob. needs to act now – to pass legislation or amend their Constitution to allow foreign deep water oil drilling companies to come into Mexican waters to drill. Since typical reports say takes 8-10 years to bring deep water oil wells on-line, and the most aggressive US experts’ estimates are 5 years to bring a deep water well on-line. Unless Mexico revises their laws and/or Constitution to allow American, Norwegian, and/or British companies to come in with deep water drilling equipment, technology, and personnel, my personal opinion is that the Mexican economy will stumble badly in the next 8 years. PAN has been unsuccessfully battling with AMLO/PRD & some the other parties (and the PRI to a lesser extent) to make legislative and Constitutional changes. Oil prices may rising to $120 by years end, as the world’s economies recover and global oil consumption recovers to pre-Financial Crisis levels. World oil consumption resumed to the break-even point of 87 million barrels per day just 2 weeks ago – where the world can only produce 87 million barrels or oil/day and we now consume that. As Europe and the US economies return to pre-Crisis levels, and as India’s and China’s economies grow by 7%-10%, placing huge demands on an overstretched supply, the world will burn through our current stored commercial reserves, placing us just where we were 2 summers ago with demand far exceeding supply and oil will likely hit $120 – $150 a barrel (or more?) – with no recession or Crisis to “save” us. Since Mexico’s current major contracts are hedged at $57/barrel, future contracts at $120/barrel may keep Mexico’s poor in Rice, Beans, eggs & Tortilla – and keep the party rolling for the Middle Class & Ex-Pats too. First Mexican oil well drilled in 1869. By 1901, big oil companies from the USA, Great Britain, and the Netherlands came in and set up big oil drilling and pumping facilities in Mexico. Think Standard Oil, British Petroleum, and Royal Dutch Shell. By 1935 all oil companies and oil production were owned by foreign companies. 1924 (first strike and small union formation) & 1935 were banner years for the formation of unions of Mexican oil workers. The Sindicato de Trabajadores Petroleros de la República Mexicana was formed in 1935 and the proceeded to make typical workers demands (40 hr work week, virtually unlimited paid-time-off for personal or family sickness, etc). The foreign companies refused to agree with strikers demands, precipitating a big strike in 1937, yet foreign oil companies continued to refuse sign. By 1938 the foreign oil companies refused to abide by various Labor board and Mex. Supreme Court judgments against them, strike continued, and these big foreign oil companies refused to negotiate even with the President of Mexico, Lazaro Cardenas. Mexican President Lazaro Cardenas “resolved the strike” by expropriating all foreign oil company assets in Mexico, and created PEMEX, so, today, we have all the nice laws listed above, and we get yet another holiday: March 18 “Dia del Expropiación Petrolera”. US/British/Dutch companies & Govts. boycott Mexico until WW2 over their lost/expropriated assets. Normal relations are resumed – and US/Gr.Britain/Netherlands basically drop all claims against Mexico – when Germany attempts to use Mexican ports as bases of operations and when Germany tries to buy Mexican oil. Some people believe that Cardenas’ expropriation has severely hindered Mexico’s economic development, because foreign companies were supposedly afraid that their assets might be similarly seized. “Who would be at fault?” The politicians of the PRD and the resistance of many Mexican people to deal with issues regarding patrimony may ultimately lead Mexico into severe economic hardship – unlike anything witnessed due to the current oil-rig platform problems. Thank God for the PAN and their rational attempts to deal with these issues.